It's time. I have now made enough engines from bar stock to attempt an engine from castings. I've narrowed the choices down to three (all of which I have ageing in my casting closet). They are the PM Research 2A, the Stuart oscillator and the Reeves Popular vertical engine. I am looking for people's experiences with these kits and which on they think would be the best "first casting set". Hi Tony. I can tell you that the PM Research 2A was the first engine I built of any kind, from casting set or otherwise. I built it using a Taig lathe with vertical slide milling attachment. Mine runs well and the paint job is perhaps its biggest flaw. I'm afraid I can't speak to the others you mention. Are they aluminum like the PM 2A? I would consider that a plus for the first-timer. 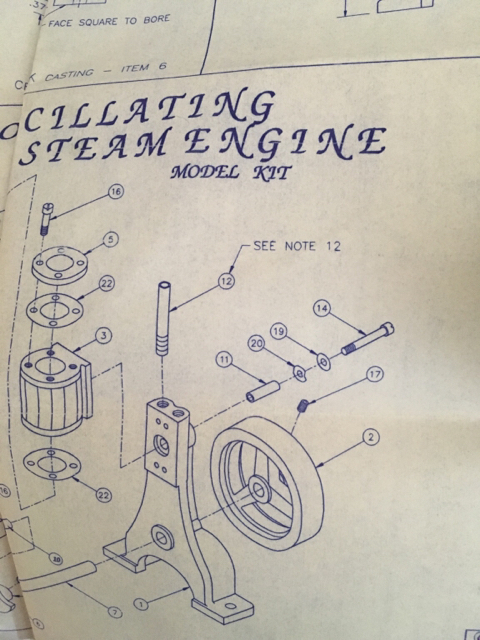 Here is the link to a Stuart "V" twin oscillating engine ( http://www.modelboatmayhem.co.uk/forum/index.php/topic,36088.0.html ) this engine was built by an Old friend of mine Mick Brown ( desceased ) , as a Patternmaker to trade he made his own pattern and had the main frame cast and did the build log before he passed away. I have built the Stuart "V" twin and can recommend it, can't comment on the others that you list. It makes a fine model, the drillings are a bit tricky but take your time before drilling, they run very well at low pressure, 10 - 25 P.S.I. 2- pics of my engine. My vote is for the PMR 2A. Fairly priced, and the best part is if you screw up a casting they will have a replacement for you at a modest charge and you can get it quickly!! Great people to work with. Jo is correct. I already have all three engines in question. (And the Stuart V twin for that matter) I'm just trying to decide which would make the best "baby's first casting set" for me. The great closet of castings has many secrets hidden away awaiting my ability to build them . I have no experience with any of those casting sets, but I will say that your approach to castings is very sound. Have you fondled them sufficiently? Oops, I missed that detail. But my vote is still for the PMR 2a. Bill right now I'm leaning towards the PMR 2A because it's aluminum. The other 2 appear to be gunmetal. I have to say I lack the self control to fondle my castings. When I get a new set I look at them and then deposit them quickly into the closet of castings before I get too attached. I eventually want my closet of castings to be as big as Jo's but I have a ways to go. By comparing the castings with the drawings it enables you to understand where and how much extra metal is on each casting in a set, identifying what can be machined off and how much you need to keep in any direction, then you can plan how to machine them. I opened up the PM 2A to perform some casting fondling per Jo's recommended process and I found something I interesting. The print is an actual Diazo print. I haven't seen one of those since the mid nineties. I think the decision is now made. PM 2A it is. Thanks for all the input. One criterion to your choice could be which castings have "extra" material to possibly compensate for booboos. Indeed you do. Not sure all of us combined can catch up to Jo's stash of castings. Castings can be classed as very rough pre machined barstock without the chucking piece left on!! it would be good to get castings that have this extra material as it makes them very much easier to machine. Using castings actually requires lots of bar stock to make the jigs to hold the parts ! rather than just chucking the bar stock. When i first starting reading model engineer in 1962, before my first lathe i was always a bit confused by LBSC's instructions to " chuck a piece of 3/8 brass" Naively i wondered, chuck it where ? !!! Just a few comments........which side of the pond are you...? this will also decide on what new castings can be acquired . here in blighty it is which side of the river.....word has it there are lots south of the river where the taxi drivers don't go !! i think it is near Guildford ! !